This adorable image was taken when we were on vacation in Gloucester, MA. BONUS INSPIRATION…Free 2014 Calendar Template for Your Photos. Laurie love this woman’s blog. Do you get her updates via email? I’m trying to find a link to do that and don’t seem to see one! Go to: http://feeds.feedburner.com/AngieMuldowneyPhotography. This is her RSS icon…but once it is opened, it will give you an email choice. Enjoy your day! I remember this song from my childhood. We used to love singing it. Oh I am dating myself, but I still remember Patti Paige singing this ditty!! Cute shot and thanks for the link for the calendars. I make this type each year!! He is cute! A true doggie in the window! I can’t say I have ever encountered a dog in the window! Yes – so precious! Adorable even. Too cute! I remember singing that song (showing my age). Perfect combination. awe….he is just precious! 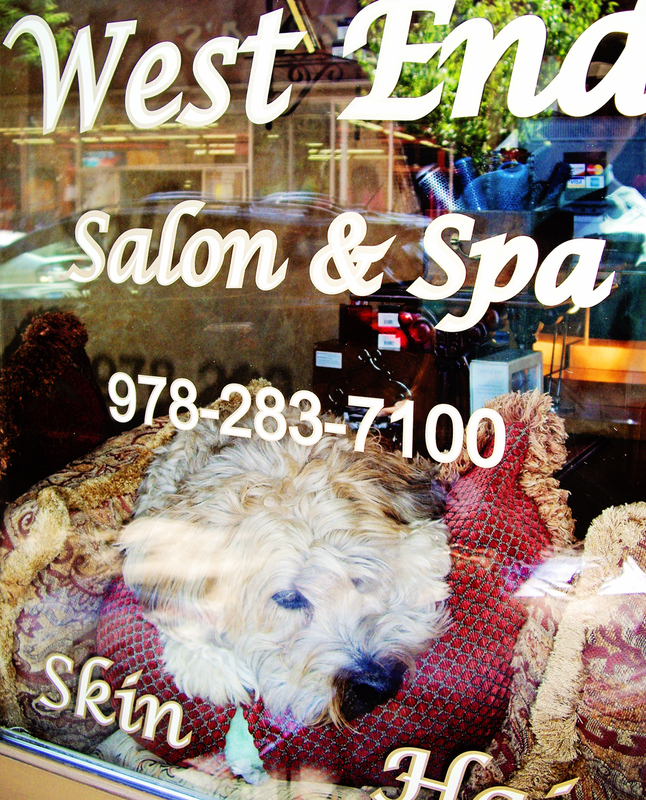 I love how they not only put him in the window, but also gave him a fluffy pillow to lay on! That is just awesome! Love this picture…and of course the song! I always put together an iPod mix for our road trips. We went out to Arizona the beginning of October and it was Dewars first road trip. I mixed in Pattie Page singing “Doggie in the Window” with the rest of the music. It was hilarious watching Dewars perk up when the “woofs” occurred! The woofs are my favorite part of the song…that is a cute story. Truly, a dog’s life!! Fun shot / lucky dog! Always great to see you and get caught up on your busy life and the Little Man. Just love him! The blog is awesome. What a cute face. I could just give him or her a big hug. You do such a great job and with a interesting variety. Have a good week. Stay cool. See you Friday. What a cutie. I lie his spot too. Looks nice & comfy. A nice place to people watch too – I’m sure. Such a cute picture! I have always loved that song, my mom bought our childhood dog because he was in the window of the pet store and she just fell in love with him. Your post brought back a very special memory. Thanks! This is great. I have that song on my IPOD. Loved it as a kid and now my 4 y.o.grand daughter can sing it all the way through. The photo brought a smile–enjoy your weekend. I love it when owners bring their sweet furry friends to work…This is a great shot of a sweet dog….Have a great weekend…. What a great life…. watching the world go by on those comfy pillows! Awwww, cutie. My sister-ilaw used to take her dog with her to the flower shop. Makes for happier customers too I think! Oh my goodness, so sweet! Hello Laurie, truly adorable, thanks for the smiles.